if you’ve been reticent about using WordPress for your websites, put down your fears and woes because you can’t find a better platform to work with. WordPress has become the favorite of millions upon millions of webmasters around the world. It’s like a dream come true for people who want to blog and gt all the advantage the pro-level blogging sites have, without the programming and coding skills required. WordPress is open source and provides a plethora of goodies that re just too mouth watering to turn down. First of all, it’s a universal platform because it’s become so popular and easy to use. It’s easy to setup and maintenance, and there’s a huge global community just waiting to help you out if you run into something you don’t understand. Matter of fact, WordPress has one of the largest community databases out there as there are always new goodies being added to WordPress such as apps and plugins. All this is FREE if you didn’t get it. Yes, WordPress is FREE and provides this kind of service! You couldn’t ask for more if they sent someone to your home or office to install it. Matter of fact, if you have a smart hosting company, they’ll have an easy self install of WordPress right then and there as well as automatic upgrading! WordPress interacts with all sorts of media and venues. There are plugins and apps that allow your posts to end up on any social media site, like Facebook and Twitter, which pushes your website’s keywords, keyphrases, keyword groups out into the limelight with you not having to do anything. Google sees this and looks at it as expansion and quality and relevant engagement. That’s work you won’t have to do and the same goes for any commentary that occurs from visitors to your blog. WordPress is one of the most Google friendly pieces of software out there. You would have to be a new kind of idiot to mess up this advantage. Just remember that honesty is the best policy, and WordPress and Google will work with you like spreading butter. That all being said, your business and personal websites need WordPress. The sheer magnitude of the goodies, the features that WordPress can handle could overwhelm you at first, but there’s help to keep your head on straight. This means you don’t have to code or programming nor hire anyone to do it for you, thus you save time and money, as well as valuable effort time. When you have software that can do hundreds of jobs professionally and it’s free, you don’t shake your head at it. WordPress has proven itself time and again, as well as having a community of responsible and wonderful people to call on if one is in need. The bottom line is, you’re either making money with your website or making friends and acquaintances. WordPress affords an easy way to use blogging with a treasure trove of free templates to use as well. 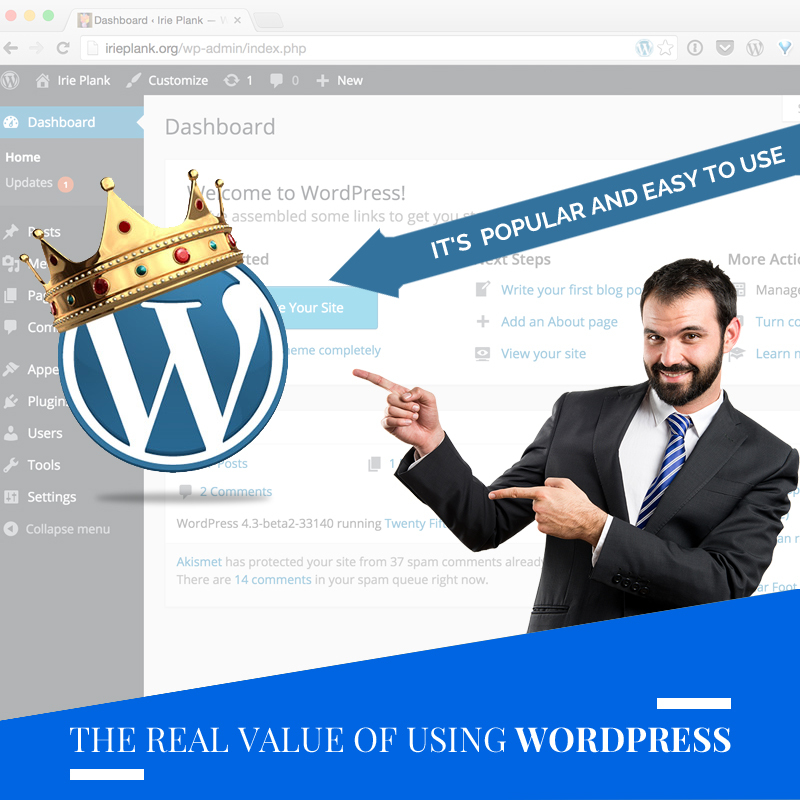 Basically, WordPress does the work for you for the most part making it easier for you to concentrate on your sales pitches, content development and more creative tasks. So don’t hold back if you’re thinking of using WordPress, it’s the kind of advantage that people can’t deny.